In a New York Times Magazine article in December of 1989, a 41 year-old writer named Paulette conveyed her sense of loss at trying to have a child in her late thirties, not succeeding, and now finding herself a successful 41 year-old writer who, sadly, “will probably never have a baby.” It wasn’t until she reached age 38 that she first decided to stop using birth control pills and try to get pregnant. She had hoped she could get pregnant naturally after learning more about the timing of her cycle and the quality of her cervical mucus. She did not understand her biological clock. It wasn’t until she reached forty that she saw a local doctor who began fertility testing, including mucus testing, hormone testing, and two endometrial biopsies . None of this plodding got her any closer to getting pregnant. She then went through the many simple, old methods of treatment that sometimes work and might possibly make sense in a young woman trying to have a baby. But not for a 38 year old woman. In fact, what Paulette went through is the conventional approach of trying to make a diagnosis and then using simple, old-fashioned methods to supposedly treat that diagnosis. The problem with this conventional view was that (1) many of these “diagnoses” are just normal variants that have nothing to do with why the woman is not getting pregnant, and (2) if a woman’s time has almost run out, fiddling around for too long with the old-fashioned approaches may waste the few precious years she has left. As physicians, we simply have to admit that we often really don’t know why a couple isn’t getting pregnant except that the wife is nearing the edge of her biological clock. Of course, a low sperm count in the husband, tubal obstruction, lesions in the uterine lining, and poor ovulation can all contribute to infertility, and all of those problems can be solved. But the biggest problem for a 38 year-old woman is simply her age. There is now simple testing that could have told her (when she was younger) just when her particular biological clock would expire and let her decide (while there was still time left) when to stop procrastinating. Some women lose their fertility in their twenties and others not until their forties. We can now explain to you how you can gauge your own biological clock at an earlier age, and indeed freeze that clock while you are still young. If you are too late for that, I will explain how you can still get pregnant if you get the proper treatment. Years ago I celebrated New Year’s with our son’s high school biology teacher and his 39 year old wife, Pam, with their six-week old baby, who never would have existed without IVF. Pam told me to make sure to tell everyone how awful it is to go through the conventional series of “diagnostic” tests and ineffective treatments for years and years with one contradictory diagnosis after another. She had gone through seven years of this at the previous clinic she had used. She had been through literally hundreds of pills, shots, doctors’ visits, and tests, not to mention worthless and potentially damaging surgery. A non-invasive ultrasound technique called “Antral Follicle Count” [see video], as well as an isoteric blood test called ”AMH”, can tell us just where you are on your age related biological clock, and when you should start to worry. When Pam and her husband came to us, I told her that I really didn’t know why she wasn’t getting pregnant. But she was in her late thirties and that was enough reason for them to be infertile; I recommended no more tests. 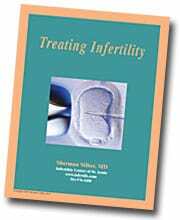 She was thrilled when I suggested we proceed right to what was then the “new” technology of in-vitro fertilization (IVF). She was fed up with trying to figure out why she was infertile and getting nowhere. After seven years of wasted efforts, Pam finally conceived with the IVF procedure, and she and her husband had a healthy baby, who is now a healthy teenager. She has no idea why she was infertile and neither do I nor her original doctors. Fortunately, for Pam, it was not already too late.